Surya Puja Vidhi – Procedure - Mantra - How to do Surya Puja? 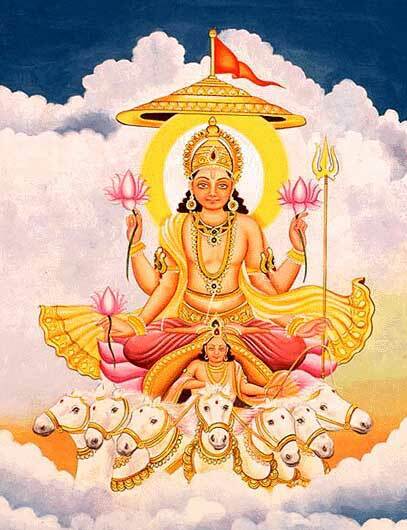 Surya Puja is dedicated to Surya, the Hindu Sun God. The benefits of the pooja include courage to face difficult situations, escape from horoscope related problems and also relief from health related troubles. Surya Puja is performed on Sunday. Here is a simple Surya Puja vidhi or procedure along with mantra. When to Perform Surya Puja? Surya Bhagavan is the king of Navgrahas and therefore it is believed that worship of him will help in avoiding horoscope or janam kundali related troubles. The puja is beneficial for people working in government or in positions related to authority. To achieve progress in career. Painting or picture of Surya (only if puja is performed inside the room). Red Flowers or if possible lotus flower. Aditya Hridayam or Gayatri Mantra prayer in book or audio format. Get up early before sunrise. The puja is performed to the rising sun. Offer water to Surya – you can pour it to the ground. Arghya water should contain til (sesame), small piece of jaggery, urad dal, honey and sindhoor. Lamp should be lit on the day using red color oil with one wick. Offer leaves of Ashoka tree. Apply red colored Tika or Chandan on forehead. Dhoop should be of Tagar. Chant the mantra ह्रीं रवये कालाय नमः ॥ 108 times. Chant Gayatri Mantra or listen to Aditya Hridya Stotram. Feeding green grass to cow on the day is considered highly meritorious. Performing donation on the day earns merit equal to performing a million yajnas. Planting and taking care of trees on the take helps in improving health. If you are fasting on Sunday, the fast is from Sunrise to next day sunrise. A single meal is taken after sunset without salt. You can eat fruits during the day.